The Beverage Buddy is a plastic cupholder with a removable insulator, 3-1/2 ” wide. It easily attaches to the frame of a wheelchair, stroller, lawnmower or bike handlebars. Manufactured by Therafin. Big Handle Utensils have lightweight nylon-covered 1″ diameter tubular handles to provide an easier grasp. Choose from the fork, teaspoon, soup spoon, or knife (slightly higher). Hand wash only. Manufactured by Therafin. 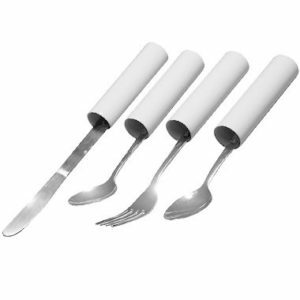 Big Handle Utensils have lightweight nylon-covered 1″ diameter tubular handles to provide an easier grasp. Set of 4 includes knife, fork, teaspoon, soup spoon. Hand wash only. Manufactured by Therafin. Coated Utensils help protect teeth, lips and gums, and cut down on the clicking noise when utensil contacts teeth. Hardcoated white end. Hand wash only. Manufactured by Therafin. Coated Utensils help protect teeth, lips and gums, and cut down on the clicking noise when utensil contacts teeth. Choose from hardcoated teaspoon or long teaspoon (slightly higher). Hand wash only. Manufactured by Therafin. E-Z Grip Weighted Utensils have large handles with additional weight to add resistance of movement for those with hand tremors. The non-slip handle surface provides a sure grip. Choose from the knife, fork, teaspoon, or soup spoon. Each utensil weighs approximately 7 ounces. Hand wash only. Manufactured by Therafin. E-Z Grip Weighted Utensils have large handles with additional weight to add resistance of movement for those with hand tremors. The non-slip handle surface provides a sure grip. Set of 4 includes knife, fork, teaspoon, soup spoon. Each utensil weighs approximately 7 ounces. Hand wash only. Manufactured by Therafin. Clear Food Guards are molded, unbreakable and dishwasher safe. The see-through guards easily slip around the rim of a round plate to confine food and aid in eating. Available in 2 sizes. Hand wash only. Manufactured by Therafin. Stainless Steel Food Guards are made from electro-polished “springy” stainless steel. They easily clip on to the edge of a round plate to help the user push food onto their utensil. Hand wash only. Manufactured by Therafin. 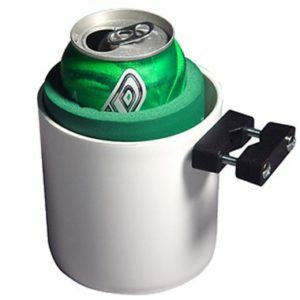 The Heavy Duty Cupholder is made from strong coated steel and is 3-1/2″ wide. It easily attaches to the frame of a wheelchair, stroller, lawnmower, or bike handlebars. Manufactured by Therafin. Paring boards are made from tough, high density plastic. Rust resistant pins hold food for paring, peeling, or slicing. 4 suction cups on underside secure board in place while cutting. 2 removable corner retainers for slicing food. Hand wash only. Manufactured by Therafin.